Looking forward to fly towards UAE to avail better job opportunity? This comprehensive guide will help you to plan and manage your job hunting journey in Dubai, UAE. It’s based upon my personal experience and I would love to share it with everyone so that everyone could get benefit out of it. The first thing you need to do, after landing in UAE is to buy yourself UAE’s cellular SIM card. You will need UAE’s cell phone number on your Cover Letter & CV. Employers prefer to reply with a phone call or an email. Job hunting process in United Arab Emirates (UAE) usually starts with a short tour to UAE which usually lasts from 1 – 3 months. This period of time is sufficient enough to search for the right job as per your qualification with good compensation. The best time to visit UAE for job hunt process is end of the current year or beginning of the new year, in short you can say November – February. Usually companies hire people in the beginning of New Year. During November – February the weather condition is also pleasant which eventually helps you in manual job hunting process in UAE. There is no need to get all degrees attested, only get your highest earned degree attested. For instance you have earned master’s degree, in that case you only need to get masters degree attested, bachelors degree will not require attestation. These all attestations will cost around $60 (220 AED). They will be helpful on your degree once you are successfully hired by the company and your company will need to attach the digital copy of your attested degree with job visa application. Make sure to keep the digital copies of your Passport, VISA, Attested Degree, Passport size photo with you all the time. Also keep these documents in your email inbox. I will try to list down the expenses you will face in UAE during your visit. On a rough note, your cost of living per month would be around $550 (2000 AED), that includes accommodation, food and travel expenses. One month tourist / visit visa for UAE costs around $150 (550 AED) (It may vary according to your region; better have consultation with a travel agent). It’s better to get visa for 2 – 3 months in the first go, since if you will go for visa extension after one month, it will cost you much higher. UAE visa can only be extended for one month and extension costs around $250 (920 AED) for the period of one additional month. Airline’s ticket price will vary according to your region. Mostly you will find Pakistanis, Indians and Filipino expats working all around UAE. Emirates Airline will offer you the best travel experience. If you do have your relatives, try to arrange your accommodation with them because it will help you save significant money. Accommodation is really expensive in UAE, more specifically in Dubai & Abu Dhabi. In case you plan to manage yourself independently good shared accommodation will cost around $270 (~1000 AED) per month including internet connectivity. Shared accommodation with 5 – 8 people will cost you around $135 (~500 AED) per month and that includes the internet connectivity too. Cost of food depends upon your life style; if you prefer to have fast food all the times, consider a big chunk of money for it around $270 (~1000 AED). However for an average person who loves to enjoy normal diet will probably manage the food’s cost at around $135 (~500 AED) for a month. Travelling cost from Metro Train in Dubai will also make around $135 (~500 AED) of expense; this might be less or more as per your travelling routine. If you are in any other state like Abu Dhabi or Sharjah, you will either have to use the Bus or Cab service which is most probably higher in cost than metro train in Dubai. You should have at-least bachelor’s degree and relevant experience of 2 – 3 years in your field. Experience may or may not be related with your degree / qualification. Prepare an excellent cover letter and Curriculum Vitae (CV) / Resume that must have your career objective, working experience, skills, achievements, educational background, personal profile and references section. CV(s) with profile picture and contact details such as an email address / phone number and current location are preferred by employers. Presentation of CV / Resume counts a lot, it must be organized properly as it will reflect the organization traits within your personality and will force the employer to call you for an interview. Cover Letter is basically a courteous application for the job in which you need to convince the employer why you are the best candidate for specific job position. List down your achievements and work experience and let the employer know your plans, how you will be able to contribute your part in the company. (That requires deep knowledge / research of job position and the company itself where you are applying for the job, reading the company’s profile). Make sure to attach your resume’s copy with your cover letter. Most of the companies require Cover Letter & CV / Resume in Word / PDF file format. Simply create your cover letter and CV in Microsoft Word and then save it as a PDF file. Now you need to target the correct job industry / category that match with your skills, experience and qualifications. Related: How To Transfer ClickBank Earnings To Payoneer Account? Complete reading of this eBook & comprehensive guide that will help you to search the job that matches your skills and experiences is two clicks away. Following crucial points have been discussed in detail in this eBook worth $2000 which I am publishing for my blog readers as a FREE GIFT. How To Directly Reach UAE Companies? When To Expect Job Interview Calls? What’s Next After Receiving Job Offer in UAE? Related: How To Create Email Accounts & Access WebMail in cPanel? Simply signup below and have an instant access to this wonderful eBook resource, which will surely help you in the job hunting process in UAE. 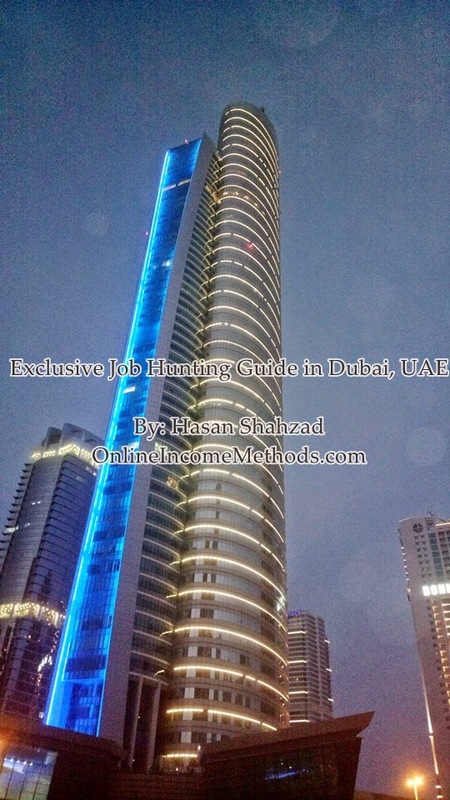 “Job Searching Guide in Dubai, UAE” eBook is worth $2000, it lists down all the important aspects and my personal experiences that you need to take care of while searching for the right job in Dubai, UAE. I want to give away this eBook for FREE to my regular blog readers as a gift. Enter your name and email address to get this exclusive eBook completely FREE! NO SPAM Guarantee: We hate spam, as much as you do, your email address will never be shared with with anyone else. How To Fix Dell Inspiron 1545 DVD Rom (TS-L633B) on Windows 7 / 8 / 8.1? ← How To Get Maximum $50 Discount & 2 FREE Domains with DreamHost?